“What I am describing now is a plan and a hope for the long term—the march of freedom and democracy which will leave Marxism-Leninism on the ash heap of history as it left other totalitarian ideologies which stifle the freedom and muzzle the self-expression of its citizens” (140). This powerful assertion references both dimensions of Reagan’s crusade to win the Cold War: prescient, unwavering vision and bold, decisive policy. Not only did Reagan clearly and repeatedly announce both privately and publicly his hope for Communism’s demise, he also strategized and employed decisive actions to achieve this end. Reagan’s administration both predicted victory and “went so far as to design and implement actions, policies, and even formal directives intended to reverse the Soviet empire and win the Cold War” (xiii). 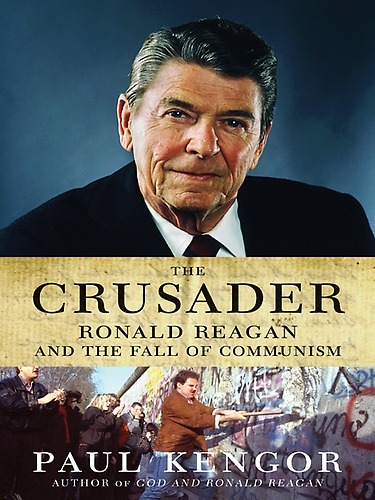 Paul Kengor’s book, The Crusader, details both components of Ronald Reagan’s fight against Communism: his beliefs and his actions. Kengor identifies Reagan’s philosophical and ideological foundation and how his Christian worldview motivated him to defeat Communism and liberate the people of Eastern Europe. Kengor also traces the specific economic, military, and foreign policies that he enacted in order to destroy the “Red Menace.” The Crusader is highly biographical, tracing the origins of Reagan’s faith and courage, his first experience with Communist tactics in the Screen Actors Guild in Hollywood, and recounting a year-by-year unfolding of Reagan’s policies while President. Kengor shows that it was no accident that the USSR collapsed. Reagan and his team both plotted and executed its demise. Kengor also puts to rest the debate over whether Reagan or Gorbachev deserves more credit for ending the Cold War. The Crusader, a truly excellent read for historian and policy wonk alike, gives highly detailed history of 1980s Cold War foreign policy and how it was connected to Reagan’s economic policies. Kengor shows how Reagan carried out his belief that if America were going to win the Cold War, he would need to boost American morale, reinvigorate the economy, and strengthen the military. His reasoning was clear: leadership in the fight against Communism needed to be “based on firm convictions, inspired by a clear vision of, and belief in, America’s future (63).” Secondly, this path required a strong economy founded on the free-market system, which provides unchallenged leadership in creative technology. Finally, unchallenged military might was needed to preserve both national security and world peace. Kengor writes that Reagan’s Christianity motivated him to fight for human rights, reject the popular Leftist belief in “moral equivalency,” and to equip him with a confidence and optimism founded in God’s sovereign plan for his life. Throughout his life, beginning with his days fighting Communists in the Hollywood SAG and ending with his Cold War victory, Ronald Reagan crusaded against Communism. Compelled by a faith in the Almighty God who created all humans in His image and ingrained in their soul a “yearning for freedom,” Reagan believed himself and his team ordained and chosen by God to lead his nation in a historic endeavor to confront and defeat the atheistic immoral Soviet empire, and, with Isaiah 40:31 as his formula, free God’s children from the oppression of Communism (xii, 298).